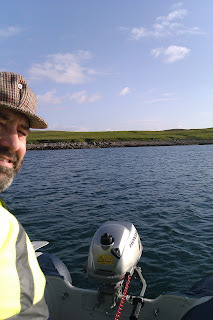 I've owned three Honda outboard motors, and this is the third, attached to a diminutive inflatable boat (also made by or rather for Honda). Four-stroke engines, none of that nasty petrol-oil mixing. All have been brilliant starters, even after weeks lying idle at storm-lashed moorings. One saved my (and my venerable Shetland Model's) bacon when the boat broke away from its mooring in a storm, was chased down by me aboard a salmon farm tender, and, amid cartwheeling waves and threatening rocks, started first pull to haul me back to shore and safety. 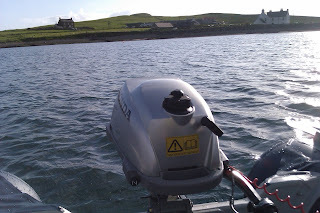 The inflatable arrived yesterday, was duly inflated and tested, with motor, this evening. You'd hardly go waterskiing using it, but for the odd spot of fishing and picnicking it's just the job. And the outboard works beautifully. Better, I have to say, much, much better, than the character-forming British Seagull I last used. Now, however, that two-strokes have been consigned to history by European environmental regulations, the monstrous Seagull, once the engine of everyboat, will gradually fade from the memories of boatie folk. It is already assuming the aura of legend: stories of Seagull motors left in a hedge for a year, cleaned up and started at the first pull. What they don't mention is that you took all the skin off both set of knuckles doing it. And had a nervous breakdown in the process. Seagulls were crude. All you needed to fix them was a hammer, it is said. I bought into that fantasy. But after 20 minutes of hitting it with a hammer, it still wouldn't go. All you have to do with a Honda is speak nicely to it occasionally.